The recent arrival of 200 electric buses made by Chinese manufacturer Yutong in Santiago has highlighted a dramatic shift in China’s relationship with Latin America. Officials in Santiago said the Yutong deal — which will give Chile’s capital the second-largest fleet of electric buses in the world, for an undisclosed price — is just the beginning of a ramp-up of Chinese investment in Latin America. “We’re at an inflection point where Chinese investment is going to start growing strongly,” said Cristián Rodríguez Chiffelle, director of InvestChile, the state investment promotion agency, for which Chinese investment is a top priority. While Brazil, Latin America’s largest economy, remains the biggest prize, China is increasingly focused on making inroads in the region through countries such as Chile, whose fast-growing economy, stable government and natural resources such as lithium — a key component in batteries that power everything from smartphones to electric cars — make it an attractive target for China’s efforts to expand its global reach. But China’s Latin American ambitions — coming as the US takes a step back from a region it once dubbed its “backyard” — have drawn criticism from those who fear Beijing is trying to expand its geopolitical dominance, leaving partner countries with big debts. Jair Bolsonaro, Brazil’s president, for instance, has complained that China is “buying Brazil”. Until recently, China’s investment in Chile was limited, despite robust trade — Chile is the world’s top copper producer and China the biggest buyer. But in November Chile joined six other countries in Latin America and the Caribbean, including Ecuador, Panama and Cuba, in signing a memorandum of understanding with China to participate in its Belt and Road Initiative (BRI), a development strategy aimed at improving infrastructure and connectivity to China from surrounding countries. The administration of Sebastián Piñera, Chile’s centre-right president, has also made increasing foreign direct investment a priority since taking office last year, enacting a law aimed at cutting red tape and encouraging new investments. The result, according to the government, was $8.2bn in FDI in 2018, a 28 per cent increase from the year before. China has seized the invitation. China-based Tianqi Lithium Corp snapped up a 24 per cent stake in Chilean lithium miner SQM for $4bn, the country’s biggest foreign investment in 2018. Chinese companies have also invested in Chile’s electricity, renewable energy, salmon and fruit sectors in the past year. China has also begun to compete with the US as a supplier of technology. Chinese ride-hailing app Didi Chuxing goes head to head with Uber in Brazil and Mexico, and is set to expand into Chile as well as Peru and Colombia. Meanwhile, a pipeline of $1.8bn of investments from Chinese companies, including the China Three Gorges Corporation, the State Grid and Alibaba would double the amount of the country’s investments in Chile from a year ago, before the Tianqui deal, said Mr Rodríguez Chiffelle. “As China’s investing and trading relationships have matured and become more commercialised, Chile and China are a natural match,” said Mike Derham, a partner at Novam Portam, a consultancy focused on the link between Latin America and Asia. China’s increased interest in Chile has not come without controversy, however. Its increased interest in the region has prompted US officials to warn Latin America about China’s “predatory” nature, and the “debt traps” it has created for developing countries. Even in Chile, which has been largely receptive to China’s advance, there has been pushback. The Tianqi deal ran into concerns about its potential to hand China more control over the already heavily concentrated market for lithium. Chilean antitrust authorities closely scrutinised the deal, prompting criticism from China’s ambassador to Chile, Xu Bu, who told local newspaper La Tercera that opposition might “leave negative influences on the development of economic and commercial relations between both countries”. A settlement was reached, which allowed Tianqi to purchase the stake but blocked it from appointing its employees to SQM’s board and required it to tell regulators about future lithium deals struck with SQM or top rival Albemarle. There was still “considerable interest” in China in striking large-scale deals with other governments in the region, said Margaret Myers, a fellow at the Inter-American Dialogue think-tank in Washington DC. But many cash-strapped Latin American governments that sought Chinese credit over the past decade had been replaced with more market-oriented administrations — most importantly in Brazil and Argentina — that preferred open bidding for contracts and partnering on infrastructure projects, she said. “As a result, Chinese companies are increasingly bidding for projects [alongside local and international firms],” Ms Myers added. Chile alone has a $14.5bn portfolio of public works projects. In a “historic” change, China will win some contracts “for sure”, said Mr Rodríguez Chiffelle. He emphasised that China had never won a concession in Chile until the China Harbour Engineering Company, the country’s second-biggest construction company, was successful in its bid to build a hydroelectric dam last year. “That marked a before and after,” he said. After recent Chinese investment announcements of major infrastructure projects to upgrade the Panama Canal and build a $3bn port at Chancay in Peru, there are hopes that Chinese companies will invest in a “bi-oceanic corridor” from Brazil to Chile, building a railway that would link South America’s Atlantic and Pacific coasts. Although the BRI has been criticised for creating debt traps in countries such as Pakistan and Sri Lanka, observers say Chile is less at risk because of its insistence that Chinese companies follow best practices and regulations, as other international and local companies are obliged to do — in contrast to the murkier rules of state-to-state deals. Officials have studied mistakes made by heavily indebted countries in Asia as a result of the BRI, and have also seen closer to home the problems experienced by countries such as Venezuela, which has had trouble repaying its Chinese debts. Whether Chinese investment reaches the proportions that many governments in the region are hoping for may depend on factors beyond their control. “China may start looking inwards more. The slowdown of the Chinese economy is making people wonder whether the flow of investment money into Latin America will come to a halt,” said Mr Derham. But Jorge Heine, a former Chilean ambassador in Beijing, argued that the size of the Chinese economy was such that there would not be a big impact on investment flows to the region. “We are going to see more rather than less Chinese investment in the years to come,” he said. The benchmark US Treasury yield hit its lowest level in more than a year on Thursday, as investors fretted about the economic outlook after the Federal Reserve predicted it would not raise interest rates this year. The 10-year yield, one of the most important global interest rates, fell below 2.5 per cent for the first time since the start of 2018 before inching higher. It marks the latest drop in a dramatic decline for the benchmark yield. It has fallen more than 70 basis points since its recent peak in November 2018, when concerns around global growth sent US markets into a tailspin during the fourth quarter. The shift has narrowed the difference been three-month and 10-year Treasury yields to just 5 basis points — its lowest level since 2007. The difference is among the primary measures of the US yield curve used by the Fed as an indicator of the health of the US economy, with a tighter range seen as a sign of slowing growth.The Fed had already indicated a more dovish tilt early this year in a bid to calm volatile stock and bond prices. At the central bank’s meeting on Wednesday, policymakers also shifted their outlook for further monetary policy tightening, dialling back their expected number of interest rate increases this year from two to none. The move has reignited fears among some investors that economic conditions are deteriorating. Some investors fear the Fed could go even further and cut interest rates before the year is out. The probability, derived from futures markets, of a cut in interest rates this year has risen to 40 per cent, from just 25 per cent before the Fed’s announcement. “Typically, the Fed is too optimistic, and so given that naive history you would think that there could be a cut in late 2019 and almost certainly multiple cuts in 2020,” said Guy LeBas, chief fixed-income strategist at Janney Capital Management. The decline in Treasury yields also dragged European government bonds lower. These bonds have already been weighed down by slowing economic data and growing fears surrounding the outcome of the UK’s exit from the EU, with the deadline just days away. German 10-year government bond yields moved 4 basis points lower on Thursday to 0.04 per cent, closing in on negative territory for the first time since late 2016. US stock markets recovered from early losses, with the S&P 500 trading up 0.4 per cent in mid-morning trade. Bill Zox, chief investment officer for fixed income at Diamond Hill Capital Management, said the Fed had effectively removed itself from further influence on markets this year, which could reintroduce volatility to bond and stock prices. Much like everyone else at the moment, JPMorgan Chase JPM -0.99%▲ & Co. is confused about where the economy is headed. It has less to worry about than most, though. At JPMorgan’s annual investor day on Tuesday, Chief Financial Officer Marianne Lake gave a cautious outlook. Downside risks to the economy are higher now than they have been for some time, she said. Indications of a coming recession “are not flashing red, but they are off the floor.” Uncertainty over global trade tensions and Brexit further cloud the outlook. Meanwhile, the future direction of interest rates, so crucial to bank earnings, is unclear. Ms. Lake noted that in the last tightening cycle of the mid-2000s, deposit rates kept rising even after the Fed had finished raising rates so JPMorgan’s deposit costs may keep rising even if the Fed pauses. At the same time, JPMorgan’s core loan growth is clearly slowing, from an average pace of 11% over the past five years to 7% in 2018 and just 6% in the fourth quarter. As a result of all this, the bank sees only modest growth in net interest income going forward. 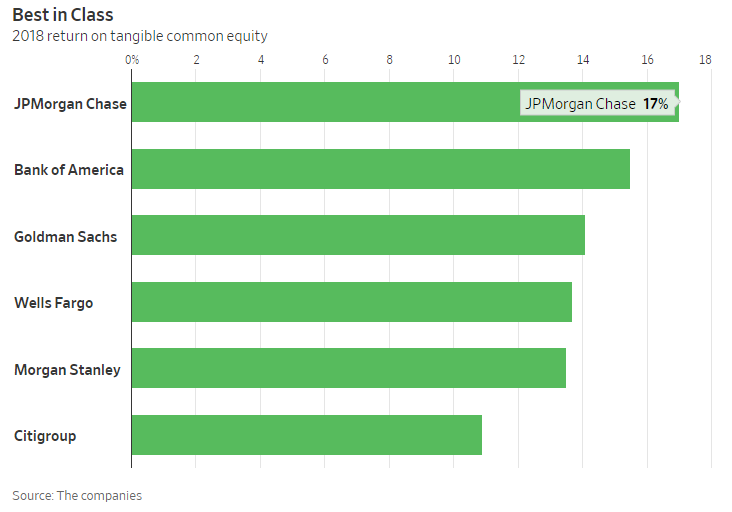 Still, investors can find reassurance in the fact that JPMorgan is humming along at an enviable level of profitability. Its 2018 return on tangible common equity, a key measure of bank performance, was a robust 17%—not only in line with its medium-term target, but also easily the highest among its peers. Wells Fargo ’sROTCE was 13.7% last year, below its 2018-2019 target of 14% to 17%. Citigroup ,with a 10.9% return last year, has a long way to go to meet its target of 13.5% by 2020. If these banks are shy of their targets when rates are rising and the economy is expanding, they will fall well short in a downturn. JPMorgan, on the other hand, could easily “overearn” on its target for the next year or two if market conditions are positive, Ms. Lake said, and still achieve a medium-term 17% rate through the length of the cycle. Bank of Americadoesn’t have an explicit target but had a respectable 15.5% ROTCE in 2018. That could easily go higher if the economy keeps cooperating. Because of Bank of America’s strong sensitivity to interest-rate movements, though, it also could fall a bit more than JPMorgan if things head south. Finally, JPMorgan has levers it can pull to keep returns high. Its investment-banking and markets businesses have strong records of gaining market share over the past few years, allowing them to potentially prosper in a downturn. On Tuesday, Ms. Lake also hinted at plans to allocate the bank’s portfolio more toward securities holdings as loan and deposit growth slow. When the outlook is so uncertain, investors are best off with an all-weather performer. The US believes that with Chinese growth slowing, China's leaders are desperate for a deal to end the bilateral trade war, regardless of when the current 90-day truce actually ends. But the two economies’ longer-term fundamentals compel a very different verdict about which side has the upper hand. NEW HAVEN – US President Donald Trump’s administration has underestimated China’s resilience and strategic resolve. With the Chinese economy slowing, the US believes that China is hurting and desperate for an end to the trade war. But with ample policy space to address the current slowdown, China’s leadership has no need to abandon its longer-term strategy. While a cosmetic deal focused on bilateral trade appears to be in the offing, the sharp contrast between the two economies’ fundamental underpinnings points to a very different verdict regarding who has the upper hand. Yes, the Chinese economy has weakened significantly in the past few months. But, contrary to US perceptions that this is due to its successful tariff strategy, China’s downturn has been largely self-inflicted. It was initially brought on by a deleveraging campaign aimed at neutralizing the mounting risks of debt-intensive economic growth. To their credit, Chinese policymakers have moved aggressively to avoid the dreaded Japan syndrome – not just a debt overhang, but also a profusion of zombie companies and related productivity challenges. Largely as a result of this effort, credit growth has moderated from around 16% at the start of 2016 to about 10.5% in late 2018. This has had marked repercussions for China’s once-powerful investment engine, the largest component of the economy, which has slowed from 20% growth in late 2013 to about 6% in late 2018. Meanwhile, the effects of US tariffs are only just starting to bite. While exports to the US fell by about 3% year-on-year in December 2018 and January 2019, shipments to the rest of the world have continued to expand, owing largely to resilience in emerging markets, especially Asia. To the extent that exports may have been front-loaded ahead of both the Lunar New Year holiday and potential further increases in US tariffs, some fallback can be expected. While that could temper near-term prospects, it is hard to pin the slowdown of the past few months on exports. To hedge its risks, China has been quick to exploit its intrinsic advantage: much greater policy flexibility than Western economies, which have largely hit their limits on fiscal and monetary stimulus. Cutting reserve requirements five times in the past year has led to higher bank lending and a pick-up in credit growth in early 2019, which should support an improvement in overall economic activity by midyear. By contrast, the US economy is more of a short-term momentum story. Thanks to the outsize tax cuts of late 2017, economic growth picked up to about 3% in 2018, nearly one percentage point faster than the anemic 2.2% pace of the prior eight years. But with fiscal stimulus fading, GDP growth should follow suit – consistent with the Congressional Budget Office’s latest projection of just a 2.3% rise in 2019. Risks of an even weaker outcome are mounting. The rebound in US equity prices in early 2019 has not offset the sharp decline in late 2018, which took a heavy toll on household wealth and consumer confidence, prompting an outsize decline in retail sales in December. With jobless claims starting to inch higher, the housing sector already weak, the global economy on increasingly shaky ground, and the Federal Reserve having limited ammunition, the US economy’s resilience looks increasingly tenuous. The likelihood of contrasting economic growth trajectories – a policy-induced improvement in China and a policy-constrained slowdown in the US – reinforces a more serious mismatch of longer-term fundamentals. 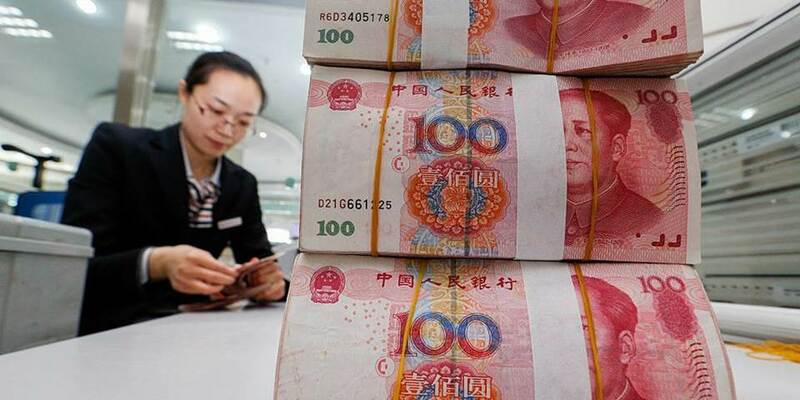 China’s domestic saving rate in 2018, at 45% of GDP, was nearly two and a half times the US rate of 18.7%. Although China’s saving rate has fallen from its 2008 peak of 52%, as consumer-led rebalancing has prompted a shift from surplus saving to saving absorption, it still has a cushion that the US would die for. Moreover, fully 85% of America’s gross saving goes toward replacement of obsolete and worn-out capital stock. Adjusting for depreciation, the US had a net national saving rate of just 3% in 2018 – less than half the 6.3% average in the final three decades of the twentieth century and even further below the net saving position of China, where the capital stock is considerably newer and in less need of replacement. These saving disparities underscore a critical difference in the investment underpinnings of both economies’ growth potential. China’s investment was 44% of its GDP in 2018, more than double the 21% share in the US. And, given America’s aging capital stock, the disparity between the capacity-enhancing net investment positions of the two economies is even wider. That underscores China’s relative advantage in funding its longer-term growth imperatives such as urbanization, investment in infrastructure, human capital, and research and development, and the shift to indigenous innovation. Moreover, the saving gap between America and China is likely to widen further in the years ahead, as seemingly chronic US budget deficits push domestic saving even lower. A further complication is that in funding its limited investment potential, the US will require equally chronic current-account deficits to augment depressed domestic saving. And, of course, with the current-account deficit comes an outsize multilateral trade deficit – underscoring the weakest link of the pending trade deal: reliance on a bilateral Chinese fix for a far more insidious deficit problem with over 100 trading partners. In the end, economic strength is relative. The US economy’s current strength appears fleeting. Its short-term resilience is already faltering and, in view of worrisome long-term fundamentals, may fade further. China is in the opposite position: today’s short-term weakness should run its course by midyear, against a backdrop of relatively solid longer-term fundamentals. This reality will come as a rude awakening to US negotiators, who are misreading China’s strength and the hollow benefits of a cosmetic trade deal. If you’re paying attention you’re probably 1) watching gold rise along with global instability, and 2) wondering if it’s finally time to load up on precious metals mining stocks. But of course you have no idea how to do this successfully, because hardly anyone does. Robert Moriarty – veteran mining analyst and proprietor of the 321gold website – has stepped into this information breach with a book that explains everything from why gold is rising to how to find (and when to sell) tomorrow’s great mining stocks. Moriarty starts by setting out the “global financial crisis” thesis which, he asserts, is a done deal. It’s coming, it’s coming soon, and when it arrives it will wreak havoc pretty much everywhere. The world’s governments will have no choice but to massively devalue the dollar, euro, and yen. Savings denominated in those currencies will evaporate, while the price of real things like farmland, gold and silver will soar in local currency terms. And because gold and silver miners are leveraged plays on the underlying metals, their bull market will be the most impressive of all. 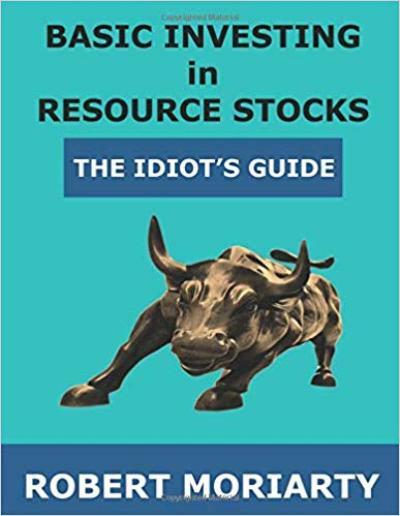 If the world is going to hell in a hand basket — and it is — and the gurus are all full of crap — and they are — and the banks are about to close, why would anyone in their right mind want to invest in resource stocks? Dr. Marc Faber says it best, in every resource conference where he speaks. He goes through the same sequence as I have here; doom and gloom, everything is going to hell. He tells his audience what they should invest in, with that broad Swiss accent. That wakes up the sleepy punters at the show. All of a sudden everyone is hanging on his every Word. He makes a very valid point. When we go into the mother of all depressions during The Great Reset, the pumped-up assets from the last ten years are going to take a giant dump. If the world is sitting on $250 trillion in debt that we know cannot be paid, those paper assets, including T-Bills, aren’t going to be worth very much. Which would you trust more: a piece of paper representing debt which mathematically can never be paid, or shares in a company investing in resources, either in exploration or mining? The question may sound simplistic, and it is, but it is also a very valid question. Would you rather have a gallon bucket of Monopoly money or a Krugerrand? Obviously you want the Krugerrand. Once that’s established, says Moriarty, half an investor’s work is done because “in a bull market everything goes up.” In other words, what you own within the soon-to-be-rocking precious metals sector is less important than that you own something in there. Gold and silver bullion, precious metals ETFs, mutual funds, and high-quality mining stocks will all do well in the coming global currency crisis. So most investors can just buy a variety of precious metals related assets and get on with life, secure in the knowledge that their capital is safe. Take profits. “If you don’t sell at a profit, the only alternative is to sell at a loss.” Moriarty relates some stories (both poignant and, alas, familiar to anyone with resource stock experience) of investors who rode mining stocks from pennies to dollars a share, only to ride those shares back down to a loss. This is the most useful part of the book, both because Moriarty knows whereof he speaks and because the junior sector is so full of landmines. By explaining the frequently crazy nature of these stocks, he takes some of the emotion out of owning them. That alone will save a lot of people a lot of money in the next few years.